The Ryerson University Library Archives and Special Collections (A&SC) has a mandate to acquire, preserve, and make accessible all non-circulating library collections materials that fall under the following categories: University Records (RG), Archival Fonds (F), Curated Collections (C), and Rare Books. The A&SC acquires items and collections of enduring archival value that can be reasonably processed, preserved, and accessed, and whose rights are ethically and legally transferable. The A&SC will preserve and provide access to all collected material according to the appropriate, current federal or provincial law (including intellectual property legislation and Ontario’s Freedom of Information and Protection of Privacy Act), Ryerson University’s Mandate, or the pertinent donation agreement. The suitability of acquisitions to the A&SC are considered on a case-by-case basis by the Library Donations Committee. Internal transfer: the Archives will accept transfer of University records according to the parameters described in the University Records (RG) acquisition criteria. Purchase: records of exceptional value to the University may be purchased subject to approval by the Library Donations Committee and the availability of acquisition funds. The A&SC, through the Library Donations Committee, applies certain selection criteria to all donations offered for internal transfer, donation, loan, or purchase. These parameters are required to ensure that our collections remain consistent and strongly related to Ryerson’s collecting and research interests, and that we are able to provide proper access and care for all materials that we acquire. Donations must include clear legal title or ownership. Proof or declaration of ownership may be required. Ryerson University adheres to donation guidelines set by the Canadian Revenue Agency. For donations valued at less than $1,000, an internal expert may establish the fair market value. For gifts-in-kind donations valued at more than $1,000, at least one independent external appraisal is required. All donations will adhere to the University administrative policy on Coordination of Donation Appeals and Gift Acceptance Procedure. Collections under consideration for donation should be accompanied by an itemized list of material on offer, including all identifying information. Advice on preparing an index can be obtained in advance from the A&SC department. The A&SC is unable to accept items that are in an advanced state of decay or disrepair. The University Records component of the A&SC repository serves as the institutional memory of the Ryerson community. The records found in this collection category are made accessible through the Archives reading room. The Archives acquires, preserves, and makes accessible a broad range of primary source materials and university records of enduring historical or permanent value, which are no longer actively required for ongoing administrative purposes. Records in the (RG) collection category provide the administrative, academic, fiscal, legal, social, and cultural record of Ryerson University and its antecedents. This includes those records created, received or maintained by: on-campus administrative and executive bodies, faculties and departments, student and Ryerson community groups, and third party entities commissioned by the University. All (RG) records accepted for transfer must have completed the active and semi-active portion of their life-cycle, and must have been deemed to be permanent records suitable for archival donation according to the Ryerson University Records Management policy. Internal transfers of acceptable materials can be arranged by contacting Archives staff and providing the relevant inventory of records on offer. When preparing records for transfer, original records are preferred to copies wherever possible. For advice on records management best practices or for information on changes to the Records Management policy at Ryerson, please contact: recordsmanagement@ryerson.ca. The A&SC repository’s (F) group category is composed of a collection of fonds whose contents document a facet of Ryerson’s history or support at least one of the key themes that represent Ryerson’s strategic research strengths. This collection category includes the records of certain long-term faculty members, University administrators, and of groups or individuals affiliated with Ryerson. Examples of (F) group collections in our repository include the Jack Layton Fonds, the Canadian Architect Magazine Fonds, and the Robert Hackborn Fonds. 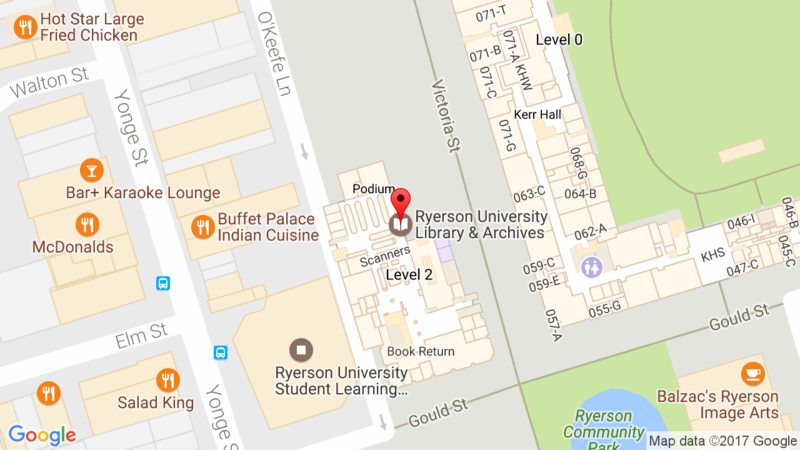 Potential donations to the (F) category of the A&SC repository must originate with a single corporate, community, or personal entity and be composed chiefly of primary source materials of enduring archival value related to the records creator’s involvement with and relation to Ryerson University or in support of at least one of Ryerson’s identified research themes. The A&SC repository’s (C) category is composed of discrete groupings of primary and secondary source materials of enduring research value that have been compiled and assembled from multiple sources around a subject specific research interest or material type. Examples of this type of collection in our holdings include the Heritage Camera Collection, The Photography and Film Technology Collection, and the Theatre Program Collection. A&SC will consider items for donation to this category that add value and depth to one of our current (C) collections. We will also consider the acquisition of new (C) collections that are composed of primary and secondary source materials of enduring research value that are related to at least one of Ryerson’s identified research themes. This category of materials consists chiefly of older editions of monographs, rare journals, fragile, scarce, and valuable books and printed materials not suitable for housing in the open stacks of the Ryerson library. Items are listed in the library catalogue and can be access by appointment. Date of publication: printed in Canada prior to 1914 or internationally prior to 1850. Significant thematic collections of published material: extensive, curated collections with a specific focus related to a research strength at Ryerson University. High monetary value: single rare books that have a high fair market value will be considered for addition to the Rare Books collection. We generally do not consider books for donation that are written in languages other than English or French that and that are not connected to a research strength or curriculum taught at Ryerson University.